Cleaning an AR-15 has never been an easy task. There are no brushes that fit correctly for complete cleaning. Wrapping a patch around a brush to make it fit and using tools to scrape away the fouling is not foolproof. 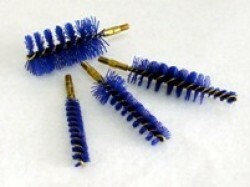 A new brush kit designed for the AR-15 is now available to take all the guesswork out of the cleaning. This kit contains an Upper Receiver Brush, Bolt Carrier Brush, Chamber Brush and .223 Bore Brush. These unique brushes are superior because they are sized to tolerance for precision cleaning. They are made out of a blue Nyflex fiber, which is a stiff, thick fiber that holds its shape well and allows for back and forth action unlike traditional brass and bronze type brushes. They may be used several times before becoming worn. The brushes are wound tightly so there is more cleaning area per inch. The shank is a solid construction, sized to fit 8/32 cleaning rods. When used with the Iosso Bore Cleaner and Iosso Triple Action Solution it will remove nasty carbon burn and all other fouling, including copper and lead.